To begin my postings at this online place where I’ll talk about food, my own recipes, and all things cooking, I want to tell you about the picture at the left (click to zoom). 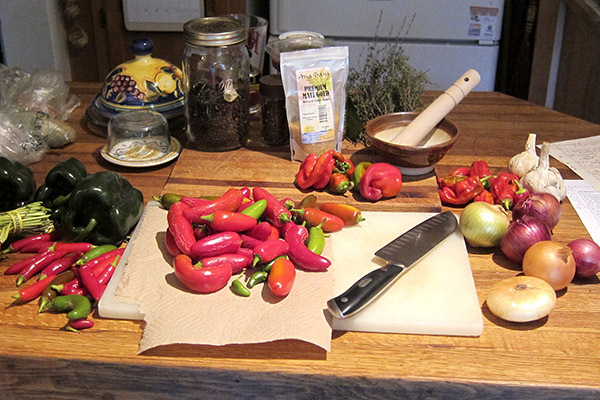 It’s our home prep area, in this case adorned with red chiles, green chiles, onions, carrots, spices, etc. 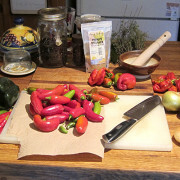 It was taken just before I made one of last summer’s salsas with our own garden chiles as well as other local veggies from the wonderful Grower’s Market in Ashland.